This is my challenge for the group on PaperCraftPlanet Cuttlebugers this week - emboss with heat and an embossing folder and they must use the color palette -- pink, black, green and white. When I started out with the Friends Never Fade SU stamp set I had no idea it would turn out this lovely. 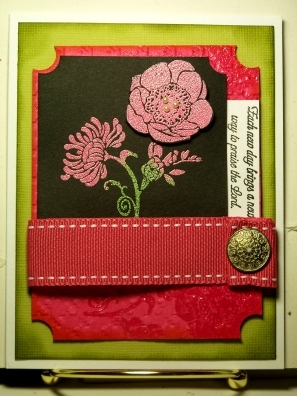 I used Versa Mark and my Wild Wasabi and Melon Mambo embossing powders to create the focal image on basic black cs and heat embossed. Then on a piece of Melon Mambo cs I used Versa Mark and the same stamp set and randomly stamped the same images then heat embossed with clear embossing powder. Then I ran the Melon Mambo cs through my machine with the Herringbone ef. I cut the corners with my 1/2" circle punch. Then I cut a piece of Lucky Limeade cs 4" x 5 1/4" and daubed Old Olive ink around the edges for some distressing. Added some Rose Red 1" stictched grosgrain ribbon and an Antique Brad. The sentiment is not SU but it reads: Each new day brings a new way to praise the Lord.